The gangland killer of Serena and Venus Williams’ beloved sister is back on the street after being released from prison, DailyMail.com reveals. Former Southside Crips gang member, Robert Maxfield shot registered nurse Yetunde Price in a drive-by shooting in September, 2003. Yetunde was hit in the back of the head with an AK-47 and died instantly in Compton, California, leaving her family devastated. Her killer is now a free man after completing his 15-year sentence early due to good behaviour. Maxfield pleaded no contest to voluntary manslaughter in April 2006 after two previous trials that ended in hung juries. Maxfield was released on parole from Deuel Vocational Institution in Tracy, California, on March 8 after getting his sentence cut for good behaviour in jail. Meanwhile, American entrepreneur of Armenian descent Alexis Ohanian says he believes the real reason he initially got tennis star – and now his wife – Serena Williams’ attention was because she had a business question, PanARMENIAN.Net reports . “I would even argue that maybe the only reason she talked to me in the first place was because at the time, I loaded up her website and it was not great and she was already looking for a better tech strategy,” Ohanian told FOX Business. Ohanian, who famously co-founded social media site Reddit in 2005, and then sold it 16 months later to Conde Nast, making him a multi-millionaire at the age of 23, met Serena at a café in Italy in 2015. Two years later, the couple announced they were having a baby and were married shortly after the birth of their daughter. But while Ohanian says he has been a good resource for the 23-time Grand Slam champion “in terms of deal flows with sponsorships and investments,” she has been more of business inspiration to him than he would have ever imagined. 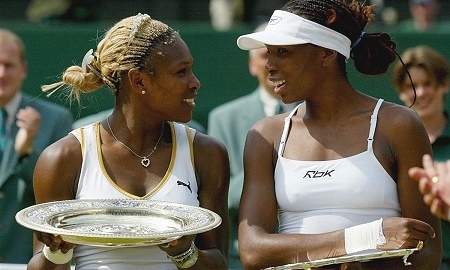 0 Response to "Serena & Venus Williams’ Sister Yetunde’s Killer Released From Prison"